Generating more offense is Bowling Green’s major emphasis this week. The Falcons are averaging just 2.5 goals and 22.7 shots per game during the last six games. They’re 3-2-1 in that span, but four of the goals came last Friday in a 4-1 win at Ferris State. BG has scored only two goals in four of those six games. Even though the Falcons have struggled to score of late, they remain third in the Western Collegiate Hockey Association in scoring at 3.03 goals per game. The Falcons seek to increase their production Friday and Saturday nights when they host Northern Michigan in a WCHA series. Faceoff is 7:07. Bergeron said BG had just 10 quality scoring chances in each of those last six games after averaging just fewer than 18 during its first 24 games. “That’s a pretty significant difference, and you can see that in the goals scored,” Bergeron said. POWER PLAY: The Falcons also have been hurt by their power play, which has fallen to sixth in the WCHA at 14.2 percent (17 of 120). BG was 0 of 7 at Ferris and is 0 of 23 in its last six games. The Falcon power play has had too many turnovers and allowed too many scoring chances during the last six games. On the other hand, the BG penalty-killing remains first nationally at 92.5 percent (115 of 124). BG has a number of players who skate on both the power-play and penalty-killing units. “We don’t have the right mind-set,” Bergeron said of the power play. “Our penalty-killers … have a focus and they’re desperate. There’s an intensity there. GOALIES: Tommy Burke “moved closer” to establishing himself as BG’s No. 1 goalie with his 43-save effort in the 4-1 win Friday at Ferris, Bergeron said. Chris Nell started Game 2, a 3-2 overtime loss. The Bulldogs took a 2-0 lead in the first 11 minutes. “I just didn’t feel ready to proclaim that we had a No. 1,” Bergeron said of why Nell started, admitting he is second-guessing himself for not starting Burke. Nell rebounded to play well after that to give BG a chance to reach overtime. Burke is 5-1 in his last six games, posting a 1.67 goals-against average and a .944 save percentage. Nell is 0-3-1 in his last four games with a 2.93 goals-against and an .896 save percentage. 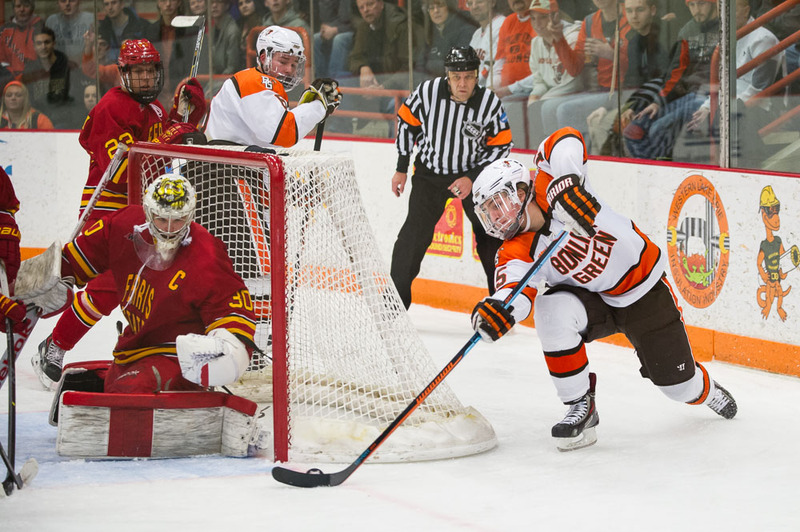 HEALTHY: BG’s Tyler Spezia is expected to return this weekend after missing the Ferris series with the flu, Bergeron said. The freshman forward has four goals and one assist in 24 games, and skates on the penalty-killing unit. Spezia skated in practice Monday and Tuesday. SERIES: The Falcons are 41-38-8 against NMU, including a 5-5 tie and a 5-0 win Dec. 5-6 in Marquette. BG holds a 21-13-3 edge in the Ice Arena. The teams didn’t play in BG last season. BEST START: The Falcons’ 18-7-5 record overall is their best record through 30 games since the 1986-87 season.